The end of the year was a whirlwind of shoots. I posted a few family shoots but am behind in posting newborns. Here’s an NYC at-home newborn photography shoot I did in downtown Manhattan towards the end of the year. This little fellow was so sweet! As a Manhattan newborn photographer, I know that new parents have different preferences on where they want to do their little one’s shoot: some people want to outsource all prep by coming to my Greenwich Village Manhattan photography studio, and some people want to stay cozy at home and have me come to them. They are both great options! For this shoot we went and visited them at home. For at-home newborn photography we bring all the necessary swaddles, props, outfits, backdrops, lighting etc. It allows us to create a variety of different images – the only thing you have to provide is your baby! If you are considering a newborn shoot, you can read my tips on how to prepare for a newborn session. I love doing a mixture of simple, classic white background and swaddle, with some more colorful setups as well. All of this can be done at my studio or at your home. We can also do a mix of photos just of your baby, and including parents as well. I bring studio lighting to my client’s homes so we can do different set ups. People often wonder about the best time to do a newborn shoot. If you want the classic curled newborn appearance for your newborn session, the best time for your shoot is before your baby is about 14 days old. To ensure availability during this brief window of time, it’s best to book your newborn shoot when you are in your second or third trimester. Of course we don’t know exactly when your baby will be bor, so we add your due date to the calendar so we we can be sure not to take on too many babies around that time. Then we are able to do the shoot after your little one is born. Portrait of the beautiful family of three. We also got some cute Santa photos for this little guy’s holiday card/birth announcement. ‘Tis the season! These three were so much fun to work with. I love this sweet mother/son moment. 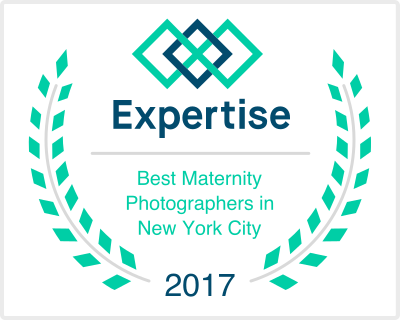 Professional Manhattan Newborn Photographer – Get in Touch! Are you interested in doing a newborn shoot of your own? Contact the studio to schedule a shoot or ask a question. We are here to help, and look forward to hearing from you! Daisy Beatty is a portrait photographer based in Manhattan NYC and the Hamptons. She specializes in vibrant images of pregnancy, newborn, children, and families, and winning headshots for actors, models, executives, and personal branding. For more information please visit her website or contact her studio.